A group of LASP scientists and students are anxiously awaiting the July 4 arrival at Jupiter of NASA’s Juno spacecraft, a mission expected to reveal the hidden interior of the gas giant as well as keys to how our solar system formed. Launched in 2011, the spacecraft is slated to orbit Jupiter’s poles 37 times roughly 3,000 miles (4,828 kilometers) above its cloud tops to better understand the origin and evolution of the largest planet in the solar system. Scientists hope to determine if Jupiter has a solid core, measure the planet’s magnetic fields, hunt for water vapor and observe the polar auroras. Three planetary scientists from LASP and five University of Colorado Boulder (CU-Boulder) students are part of the Juno mission. “We are crossing our fingers and toes, hoping all goes well,” said LASP planetary scientist Fran Bagenal, who co-chairs the Juno Magnetospheric Working Group for NASA and is coordinating many of the science observations for the mission. As the bruiser planet of the solar system, Jupiter is 320 times the mass of Earth and holds 70 percent of the mass of all the solar system’s planets. Scientists believe Jupiter may have moved closer to and farther from the sun a few billion years ago and had a significant influence on the solar system. Bagenal is particularly interested Jupiter’s magnetosphere, the area of space around the planet that is controlled by its magnetic field. She and her collaborators want to better understand the processes that create the aurora activity at the planet’s poles—its northern and southern lights—and assess the roles of the planet’s magnetic field on its surroundings. One of the biggest questions that remains about Jupiter is how much water there is in its atmosphere, since water was a big player in solar system evolution said Bagenal, also a professor in CU-Boulder’s astrophysical and planetary sciences department (APS). In addition to Bagenal, LASP Professor Bob Ergun and Research Associate Rob Wilson are part of the Juno science team. Ergun, also an APS faculty member and an expert on Earth’s magnetosphere and associated polar auroras, will be comparing the physical processes at Jupiter with those on Earth. Wilson is a member of the JADE instrument team that will be using Juno to detecting and analyze the electrons and charged particles that produce Jupiter’s bright auroras. Data from the Juno mission should also help scientists better understand the hundreds of planetary systems recently discovered around other stars, said Bagenal. A number of giant, gaseous planets known as “hot Jupiters” have been discovered in the past two decades, most so close to their parent stars that their orbital period is just a few days, compared to the roughly 12 years it takes Jupiter to orbit the sun. 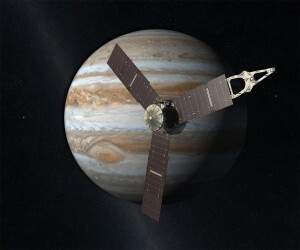 Bagenal also has worked on five other NASA planetary missions, including the Galileo mission that reached Jupiter’s orbit in 1995 carrying two LASP instruments. She also is the Particle and Plasma Team leader for the New Horizons mission that whipped by Pluto last summer and is now heading into an icy region called the Kuiper Belt beyond Neptune’s orbit. As part of the CU-Boulder Juno effort, Bagenal is mentoring CU-Boulder summer school student Lucy Todd—a participant in LASP’s Research Experience for Undergraduates program—to build a radio telescope on campus in hopes of detecting radio emissions from Jupiter. Other LASP contributors to the Juno mission include undergraduate Kaleb Bodisch, 2015 CU-Boulder graduate Logan Dougherty, now a LASP research associate, and graduate students Drake Ranquist and Edward Nerney. Ranquist, a doctoral student in astrophysics, has been involved in the planning stages of the Juno mission for the past three years, using computer models to help predict which of Jupiter’s magnetic field lines the spacecraft will cross during every part of the mission. CU-Boulder is the only university in the world to have designed and built space instruments that have visited every planet in the solar system, including the dwarf planet Pluto. While Juno is about the size of a Volkswagen and is encased in a protective radiation vault, its three solar panels make the spinning spacecraft more than 65 feet in diameter. The Juno principal investigator is Scott Bolton of the Southwest Research Institute in San Antonio, Texas. The Juno spacecraft is carrying 11 experiments and includes a camera to provide images of the colorful Jovian cloud tops. The mission is being managed by NASA’s Jet Propulsion Laboratory in Pasadena, California. Lockheed Martin Space Systems Company of Littleton, Colorado, built the spacecraft. Denver-based United Launch Alliance built the Atlas V rocket that launched Juno in 2011.